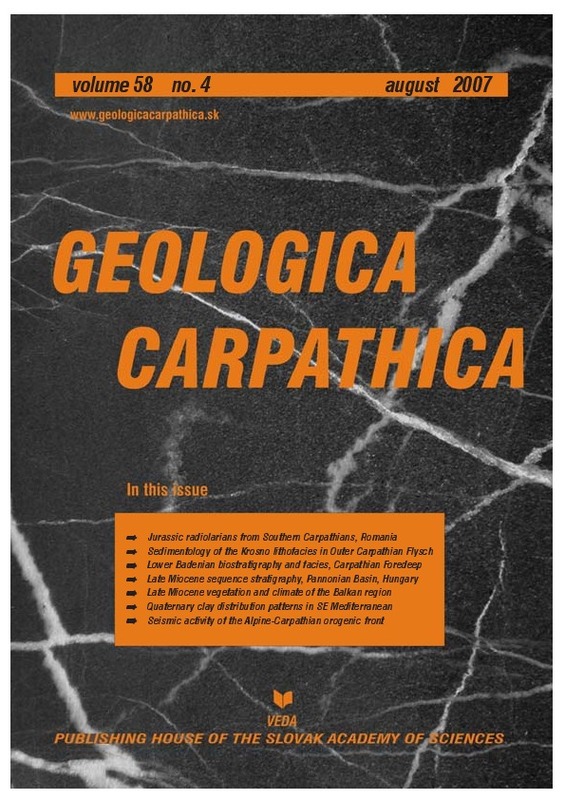 Abstract: This paper regards the description and the first dating of the radiolarian assemblages of the Jurassic siliceous successions in the Bucegi and Piatra Craiului Mts (Southern Carpathians, Romania). The most representative Jurassic outcrops for this area have been sampled: La Poliţie, Strunga, Strunguliţa, Rătei Valley and Sfânta Ana Olistolith (Bucegi Massif), and Sirnea, Umeri and Vladusca (Piatra Craiului Mts). The investigated successions are formed by a great variety of sediments, most of them characterized by a large amount of siliciclastic admixture. The sampled layers are constituted by well stratified siliceous limestone or chert, and their thickness usually ranges between 0.5 and 1 m. The Sfânta Ana sample comes from a Jurassic olistolith included in a Lower Cretaceous flysch. The Nassellaria/Spumellaria and sponge spicules/radiolarians ratios provided information about the depositional environments. In well-preserved samples the N/S ratio varies from 1.7 to 2.8, and the spicules/radiolarians ratio is around 0.6: this means that the siliceous sediments were deposited in distal or relatively deep waters. The biostratigraphical analysis has been carried out by applying two radiolarian zonations based on the Unitary Associations method: most samples are referred to the middle-late Oxfordian. The only exception is represented by the Rătei sample that is assigned to the Callovian. The Romanian successions are easily comparable with other Tethyan sections where the Oxfordian levels are generally the richest in radiolarians. Even in environments with siliciclastic supply (Southern Carpathians) the sedimentation drastically changed during the Oxfordian and became siliceous.